The day had dawned blustery, clear and cool, with winds gusting to around 20 knots. The fleet of 18 Marshall Sandpiper 15-foot catboats, all fighting for the world championship, had made a clean start for the first race of the seventh biannual Catboat Rendezvous, held on Southwest Florida's tiny Useppa Island. Spray rushed past the gleaming fiberglass hulls. A pod of bottlenose dolphins wove its way through the competitors. Perennial winners Richard Dimmit, Bill Welch and Mike Albert were leading the pack, and had already opened up a four-boat-length lead on the rest of us. Kurt Stocker and I, sailing Kurt's 5-year-old catboat Ragtime were dead last. And not happy about it. To be fair, Kurt and I are more accustomed to pushing around 20-ton keelboats than 1,000-pound catboats. He is a former commodore of the Chicago Yacht Club with more than a few Chicago-Mackinac races under his belt as well as a gold ring in his left ear signifying his rounding of Cape Horn in 2003. I am a proud owner of a 26-year-old, 43-foot Endeavor ketch, a boat built more for comfort than speed. We were both having a hard time adjusting our large-boat sailing style to the quick but temperamental cats. "When you make a mistake sailing a keelboat, the boat's design will forgive even the most egregious error," Kurt said. "Take your eyes off the sail for only a few seconds in one of these, and you'll not only lose precious seconds, but strategic position in the race." But even the most frustrating day on the water beats the best day on land. And Kurt and I were determined to improve our dismal position even if it meant renouncing our big-boat driving ways and opting for a kinder, gentler hand on the tiller. In all fairness to Kurt, it was more my lack of skills than his that had resulted in our rear-end position. The second race of the day proved no better when we hit the leeward mark at the start, took the requisite penalty turn, and then watched the rest of the fleet hightail it to windward while we were stuck in irons trying to sort ourselves out. Ugh. The result of our good samaritanism was a DNF for the second race, but we felt good about our quick response to the potentially dangerous situation. "Thank goodness we didn't foul Charlie's boom," was my immediate thought, as we headed to the beach for an early lunch. "That would have been the coup de gras for a disappointing morning's performance." "Concentration, concentration, concentration, it just goes to show you what can happen in these boats if you lose focus on what you are doing," Kurt said. The history of catboats stretches back to the early 1800s, when generations of hardy watermen depended on these stable, beamy boats to bring back bountiful catches of mackerel, swordfish, cod, scallops and lobster while plying the waters around Cape Cod, Narragansett Bay, Long Island Sound and New Jersey. Larger catboats were also used as pleasure craft and ferries. Some of these boats reached longer than 50 feet in length and carried upward of 65 passengers. Few of the early wooden catboats survive. As a class, catboats are identified by a broad-beamed design with a retractable centerboard and a sail set well forward. Most catboats employ a four-sided gaff sail; while some sport a more conventional three-sided marconi rig. Generally, the beam of a catboat is half of its length. No one knows for sure how catboats got their name, although legend has it that early catboat designer Herbert Crosby once remarked "these boats sail quick as a cat." The name has endured for almost 150 years. Writing in The Rudder magazine in 1896, publisher Thomas Fleming Day opined: "If there is truly an American vessel-mind you I don't say rig-that deserves being described as the national type, it is the catboat." Geoff Marshall, general manager of Marshall Marine and son of catboat pioneer Breckenridge Marshall, estimates there are probably about 10,000 catboats afloat in U.S. waters, yet only a handful of manufacturers survive. These include Marshall Marine, Arey's Pond, Com-Pac Yachts, Cape Cod Shipbuilders, Beetle Cat and Mengers. Catboats come in all shapes and sizes, from the tiny 12-foot-long Barnstable and Chappaquiddick cats to the more commodious 26-foot Atlantic City Cat with standing headroom. Through the years, the boats have earned a reputation as being comfortable daysailers, spacious cruisers and sure-footed racers. Indeed, the catboat's shoal draft and spacious cockpit make it ideal for gunkholing where the water is thin and the yen for adventure is high. Catboat fleets abound in Massachusetts, Connecticut, New York, New Jersey and Florida. There is increasing interest in catboats in coastal Georgia, the Carolinas and California. The appearance of catboats on the west coast of Florida is a relatively recent occurrence. The first catboat to make its way to Useppa, an 80-acre private island located between North Captiva and Boca Grande just off the Intracoastal Waterway, was Gretchen and John Coyle's Marshall 15-foot catboat Sink R Swim. "This was around 1984 and we used the catboat as a great big suitcase to transport essentials from our summer home in New Jersey to Useppa," John Coyle said. It wasn't until a couple of years later that another catboat, this one owned by Chapin, found its way to Useppa's secluded shores. "You know what they say," Chapin said, "it takes two to tango, and from that point on, with two boats on the island, every time one of us went out to sail, the other dropped what he was doing and a new race was on." Now, the island boasts what could be the largest catboat fleet in Florida, with a permanent catboat population of 17. On Useppa, catboat sailing is very much a family affair. Many husbands and wives trade off crewing and skippering responsibilities, and on more occasions than not, the weekly Useppa races will feature more women than men. Gretchen Coyle and Sherry Welch regularly top the roster of Useppa's best sailors. "These little boats are ideal for our part of Florida. Most of us are former big boat sailors. We aren't ready to give it up and become trawler drivers so sailing catboats keeps our hands in it and provides each of us a lot of fun. We race to keep those competitive juices flowing then beach the boats for an afternoon of shelling with the grandkids," Coyle said. "I like to compare sitting around the cockpit of these boats to sitting around a campfire in the woods. There's plenty of room for conversation about the state of the world or the state of the wind." Coyle recalls with glee a race he and then 95-year-old Thurston Greene, a perennial Useppa's visitor, waged with Chapin. "We were out just fooling around when out comes Charlie," Coyle said. "I looked at Thurston and said, 'want to have a go?' He thought a minute, nodded his assent, and we raced Charlie around the island. We won, naturally, not bad for a boat crewed by a man almost as old as catboating itself!" 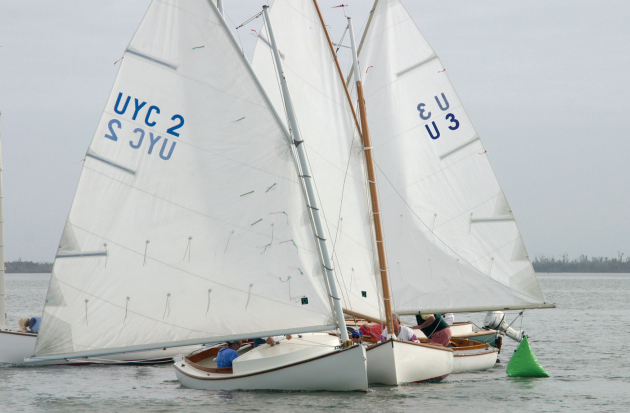 All of the catboats in Useppa's fleet are Marshall 15-foot Sandpipers, manufactured by Marshall Marine Corporation, South Dartmouth, Massachusetts. Breckenridge Marshall pioneered the production of fiberglass catboats in 1961. He was assisted in his early endeavors by a young Charlie Chapin, who loaned Marshall some of the seed money he used to buy the first fiberglass forms for his business. Marshall Marine builds about 20 boats annually. Geoff Marshall estimates that the Marshall fleet numbers somewhere around 1,400 boats worldwide. The vast majority of Marshall cats are in the United States. But some have found their way to far-flung places such as Germany, Denmark, Antigua and Chile. Used mostly for coastal cruising and racing, some Marshall cats have nevertheless ventured far afield, one even negotiating the almost 1,500-mile round trip voyage from Massachusetts to the iceberg fields of Newfoundland. An accomplished sailor in his own right, the 42-year old Geoff is optimistic about the future of catboats in the years ahead. "One aspect of the catboat that has become very appealing to sailors in many regions of the country is the versatility and cruising range that a catboat offers," Geoff said. "While many harbors get crowded to the point that there is no room to anchor, the catboat can access many more areas because of the shoal draft and therefore expand your cruising grounds. They also offer a comfortable, stable sailing experience that can be enjoyed by sailors of all ages and abilities." Prices for a new Marshall Sandpiper start at $16,900. There is an active resale market for catboats nationwide. The Catboat Association maintains a clearinghouse of used boats at its Web site, www.catboats.org. Prices range from $3,000 for a reconditioned 12-foot Beetle cat to $25,000 for an almost 100-year-old 27-foot Crosby cat. The idea for the Useppa Catboat Rendezvous was born after Coyle wrote several articles for local sailing magazines about the popularity of the boats in southern Florida. An accomplished sailor in her own right, Coyle has promoted catboat sailing not only in Florida but across the United States in her role as editor at large for the Catboat Association Magazine. The Worlds are held on Useppa every two years and as soon as one year's event is concluded, Gretchen starts preparation for the next. "Our rendezvous is for catboat aficionados; one need not bring their boat to attend, just be a catboat lover. It is a three-day event with something for everyone, everything from a beach party and catered dinner at the Tarpon Restaurant, a tour of historic Useppa Island and museum to a Sunday brunch and awards ceremony," said a sunburned Gretchen. "The first year we had 25 people and a horrible cold front, but catboating friendships were forged. People keep coming back year after year. Catboats are the best thing to happen in Southwest Florida since Cuban food. With our aging population, sailors are getting out of high-tech, youth-oriented boats. The popularity of oldtime catboats can only increase." This year's Worlds drew 18 15-foot catboat entries and eight "big boat" entries, representing at least five different manufacturers. Crews came from as far away as Germany and France to participate. More than 150 sailors, workers and hangers-on participated in the late January festivities. The official race card consisted of seven one-mile races held over two days. Halfway into the regatta Kurt and I not only had come in last in every race, but Kurt's wife and her crew were solidly ahead of us in points-a fate too awful for contemplation. Our lunch of charbroiled burgers and bourbon-laced baked beans was a solemn affair. We had to do better in the upcoming events. We needed help, and we found it in the person of Charlie Chapin's daughter Nancy. "When Nancy was a baby, we were living aboard a sailboat," Chapin said. "So we brought her home from the hospital to a home on the water. She's been a sailor ever since." In addition to a lifetime of small-boat sailing, Nancy, a 30-something Roanoke, Virginia, resident, holds the distinction of being part of the first all-woman crew in the famed Newport to Bermuda race. She not only brought a touch of needed expertise to our beleaguered boat, she also brought the gentle touch of a small-boat sailor to our tiller. "She's got a feel for these boats," Charlie Chapin said. "That touch is a gift. Either you've got it, or you don't." We were glad to have Nancy on our side. Nancy made her presence felt aboard Ragtime immediately. She pointed out a flaw in our sailplan, and she helped us flatten the sail, enabling us to point higher. She improved our tactics at the starts and brought our game up to a level of respectability heretofore unimagined. We even had the lead for two legs in the last race, which was something Kurt and I will never forget. Sooner than anyone had anticipated, the rendezvous was over. In the eight-boat "big" catboat class, the winners were Griff Nolan and his crew from Pass Christian, Mississippi, with Cindy, Charlie and Chip Clifton from Sarasota, Florida, in second. Richard Dimmit, also from Sarasota, won the 15-foot World Championship. In second place were Bill and Sherry Welch of Useppa. Third was Mike Albert of Sarasota. At least half of the crews were women. An all-woman team, skippered by Carol Robinson with Useppan Cindy Castellanos and a friend on Cindy's Folly, finished a respectable ninth. For the record, their catboat's hull featured pink gelcoat and the crew wore matching pink outfits. "It's not about winning or losing," said Geoff Marshall, who came in fifth sailing a loaned 15-foot cat. "These boats are all about camaraderie, providing a common ground for competition, sure, but providing a springboard for friendships that will last far beyond our days here on the island." Postscript: Under the "you can teach old dogs new tricks" heading, this writer is pleased to report that Kurt Stocker pulled down a first and a second in a recent spirited Useppa Island catboat competition, besting many of the skippers who finished ahead of us in the rendezvous. I further enhanced my less-than-stellar record by helping another skipper finish in last place three consecutive times. Where was Nancy when I needed her?